"Indian with Fetish" "Mending the Dress"
"A Riverside Town" "Fishing the Rio Hondo"
Oil on canvas, 25" x 36" Oil on canvas, 10" x 14"
"Landscape with Deer" "VALLEY VISTA"
"Des Montes Ranch near Taos" "Along Canyon Road"
"Across the Valley" "Fisherman's Wives"
"Rainstorm Taos Mountains" "Mountain Aspens, Taos"
oil on canvas, 30 1/4" x 30 1/4"
Hennings said, "[Taos] aroused my unbounded enthusiasm." the adobe village with its Spanish people and of course the Taos Pueblo with its Indians. Their life - domestic and agricultural - with all the color and romance of their dress and history." 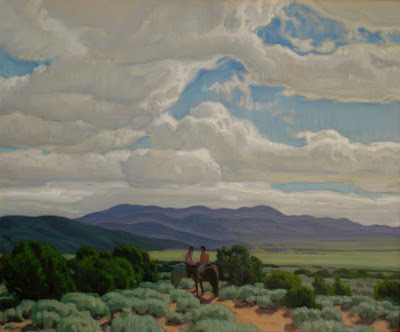 He said: "New Mexico has almost made a landscape painter out of me, although I believe my strongest work is in figures." rather than by a style modeled through the intellect." "It was rather strange that I chose painting for my profession, for practically none of my family showed artistic tendencies. It happened that when I was twelve or thirteen years old, another lad and myself wandered into the Art Institute of Chicago and it was during that visit that I was determined to become an artist." "In every picture I expect the Fundamentals to be observed, which I term—draftsmanship, design, form, rhythm, color." 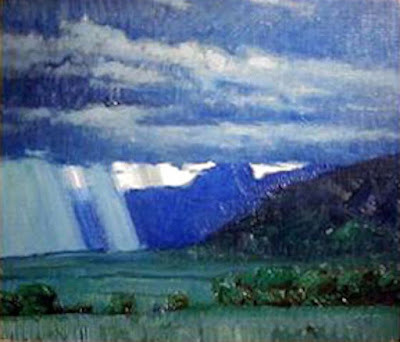 E. Martin Hennings first visited Taos in 1917 on a three month painting trip sponsored by Carter Harrison from his native Chicago. 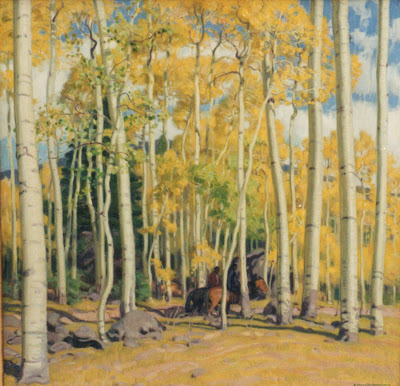 His art nouveau-inspired impressionism, often showing Taos indians riding through the aspens, has made his work one of the most sought-after of the Taos Society of Artists members. Born to German immigrant parents, the Hennings family settled in Chicago when E. Martin was just an infant. The burgeoning lakeside city offered young boy an ideal setting in which to embark on his artistic path. Consequently, Hennings enrolled in the School of the Art Institute of Chicago from 1901-1906, and the firm foundation in drawing that the school provided remained a hallmark of Hennings' work. The artist first gained recognition as a freelance muralist and illustrator, but quickly tired of commercial art. In 1912, Hennings garnered a second place prize for a piece that he entered in the Prix de Rome. This success became the impetus to move to Munich to study at the Royal Academy. 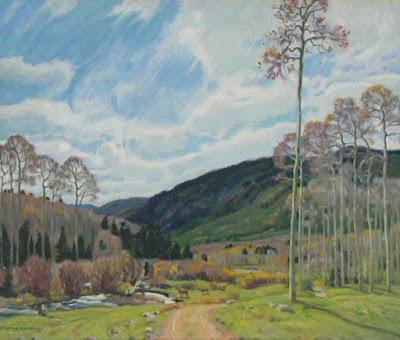 While in Europe, Higgins also met Walter Ufer and Victor Higgins, whom he would rejoin in Taos, NM, five years later. During Hennings' return to Chicago he obtained the attention and financial sponsorship of art patron and former city mayor, Carter Harrison. 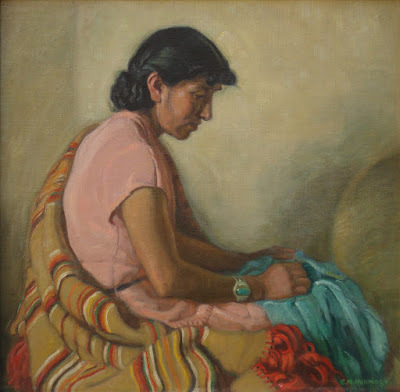 It was agreed that young artist would spend time in Taos, NM, in exchange for whatever paintings the artist could produce of the region. 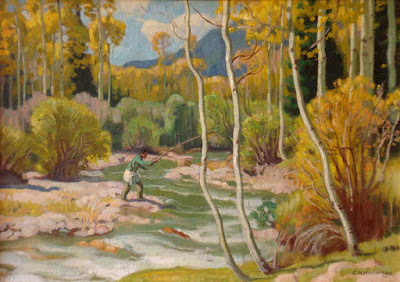 Hennings always stated that he preferred figure painting, although the landscape of Northern New Mexico proved irresistible and Taos helped to expand the painter's repertoire. 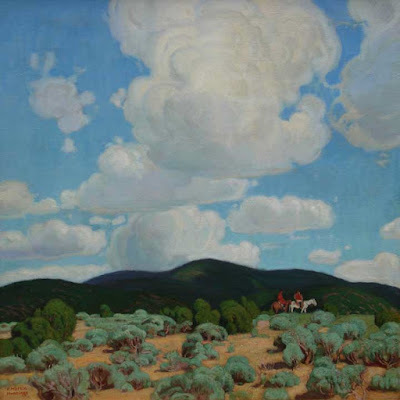 In 1924 Hennings gained membership in the Taos Society of Artists, and found the scope of his exhibitions growing to include a broader, global market. 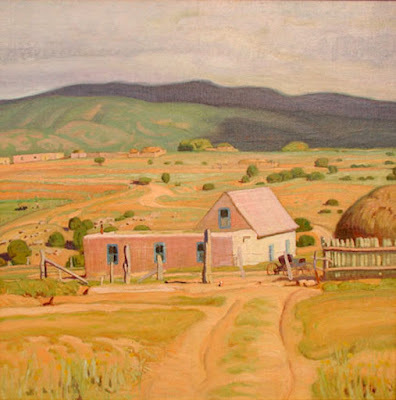 In Hennings' final years before his death in 1956, the artist completed a series of five paintings commissioned by the Santa Fe and Topeka railroads, to be used as calendars. It was a subtle reminder, perhaps, of the many gifts that came to pass through his hometown of Chicago. According to his wishes, he is buried there. Hennings only signed his work after he was satisfied with it. Authentic signatures are only a part of certifying Traditional Fine Art. Parsons does not offer Ernest Martin Hennings prints, because no print can compare to the real paintings. 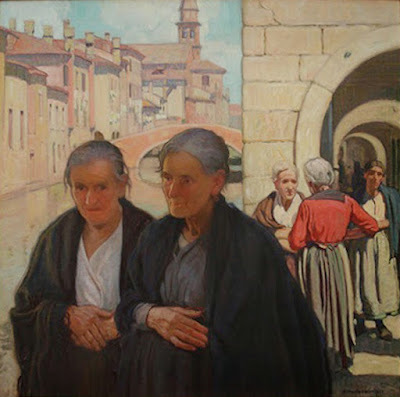 Ernest Martin Hennings was also called E Martin Hennings or Martin Hennings. Hennings was born in Penns Grove, New Jersey, on February 5, 1886. In 1888 Hennings and his family moved to Chicago. He was the son of German immigrant parents, growing up in Chicago. The Pennsylvania Academy of the Fine Arts. From 1901 to 1904 he studied at the Art Institute of Chicago, graduating with honors in June 1904. He continued to study at the Art Institute of Chicago for two more years under John Vanderpoel. In 1912 he started studies at the Munich Academy in Germany. There he met Walter Thor, a major influence for his growth. In 1912 he began studying at the Royal Academy with Franz Von Stuck, the German proponent of Jugendstil. 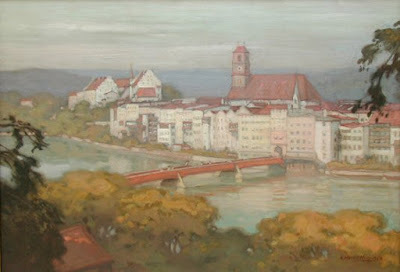 In 1914 he became a member of the American Artists club in Munich, Germany, meeting Walter Ufer and Victor Higgins. With the beginning of World War I in 1915, he moved back to to Chicago, working as a commercial artist and muralist. He joined the Palette and Chisel Academy of Fine Art. 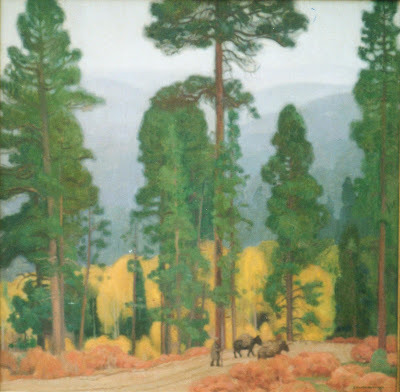 In 1917, Carter Harrison and Oscar Mayer paid Hennings to travel to Taos, New Mexico and paint. In 1921 Hennings began living full time in Taos. 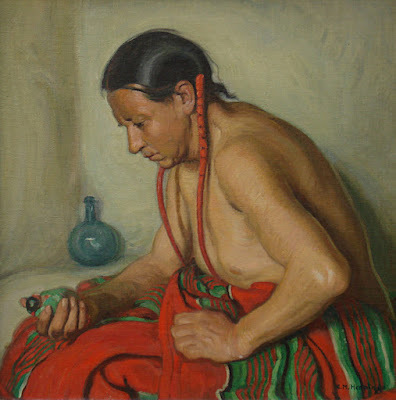 In 1923 he was nominated to the Taos Society of Artists. He was elected in 1924 by unanimous vote. 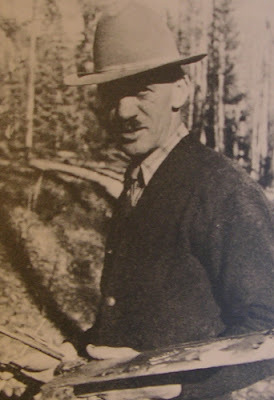 In 1924, Hennings took up permanent residency in Taos, New Mexico. In 1925 he met and married Helen Otte on July 20, 1926, who worked at the Chicago department store Marshall Field. They honeymooned in Europe, spending 16 months in Italy, France, Spain, and Morocco. In the 30s and 40s Hennings painted portraits part time in Houston, Texas. His last works, paintings of the Navajo Reservation at Ganado, were for the Santa Fe Railroad Calendar. He died May 19, 1956 and was buried in Chicago. "String The Bow" n.d. etching, 15 x 16 1/2 in. 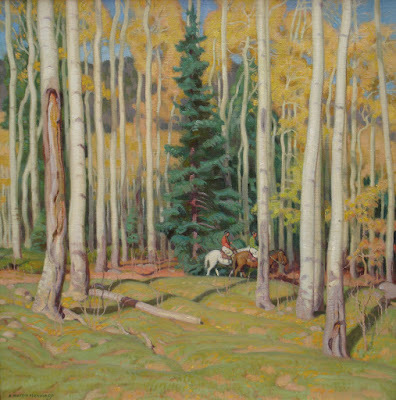 Hennings said: "New Mexico has almost made a landscape painter out of me, although I believe my strongest work is in figures."